Safe and Sound: Caring in Our Community | Kids Serve Too! In this webinar, representative(s) from the Sesame Street Workshop explore trauma connected to community violence, highlight ways to help children cope, and focus on strategies that assist with self-care following a disturbing event. This event is hosted by the Family Development concentration area of the Military Families Learning Network. Antonio Freitas is the Senior Content Manager at Sesame Workshop. Here, he works to develop content and professional development resources and course for Sesame Street In Communities. Prior to joining the US Social Impact Team at Sesame, Antonio worked as an early childhood Deputy Director with The Children’s Aid Society in New York. In this role, he professionally developed teaching staff, and managed educational compliance across the agency’s 14 early childhood sites in Harlem, Staten Island, the Bronx, and Washington Heights. Prior to this role, Antonio managed sites as a Program Director leading staff, students, and families in the Early Head Start and Head Start initiatives. Before his involvement with The Children’s Aid Society, Antonio worked at Uncommon Schools, recruiting for the charter management organization from 2009-2011. Antonio’s earliest forays into education were teaching in second grade classrooms, chairing the initial cohorts at Leadership Prep Bed-Stuyvesant at Uncommon Schools, (2007-2009), and within NYC’s Department of Education as a Teach For America corps member at PS 170 in the Bronx from 2003-2007. During this time, he completed his MS in teaching from Pace University. Antonio holds a BA in social work from Seattle University. In school, Antonio’s focus centered on restorative justice programs he managed at the Monroe State Penitentiary for men serving life sentences, as well as an internship at The Lambert House, providing case management and Life Skills courses to homeless LGBTQ youth. Sabrina Huda is the Senior Project Manager for various Sesame Workshop initiatives that reach our most vulnerable and underserved kids and their families. As such, she works with key partner organizations that are committed to helping all kids become smarter, stronger, and kinder. Currently she leads Sesame Street’s initiatives for Military Families plus initiatives spanning from literacy and numeracy to resilience and addressing trauma. Sabrina formerly worked on Sesame’s international projects in the Middle East, Afghanistan, Bangladesh and Indonesia. Prior to joining Sesame Workshop, Sabrina was an Assistant Director and Case Manager at Spence Chapin working in domestic adoption. She was also a Teacher and Coordinator at the Barnard Center for Toddler Development. Sabrina holds a Bachelor of Arts Degree in Neuroscience and Behavior from Barnard College and a Masters of Arts from Teacher College, Columbia University. When not on longest street in the world, Sabrina will most likely be strolling is Central Park or starting a fire in her kitchen with some kooky recipe! MFLN will apply for 1.5 continuing education (CE) credits from the University of Texas at Austin – Steve Hicks School of Social Work. This program has been submitted to the Commission for Case Manager Certification for approval to provide board certified case managers with 1.5 clock hours. Certificates of completion are available for providers interested in documenting their training activities. You will be prompted to complete an evaluation after which a link will be provided. Kids Serve Too! is a webinar series designed to support service providers and education professionals who work with military children and families. This Sesame Street for Military Families and Military Families Learning Network collaborative webinar series invites you to explore resources and strategies related to community violence, military relocation, military caregiving, and young children with special needs. Learn more about the series, sign up for the mailing list and take a look at the other webinars in this series on the Kids Serve Too homepage! 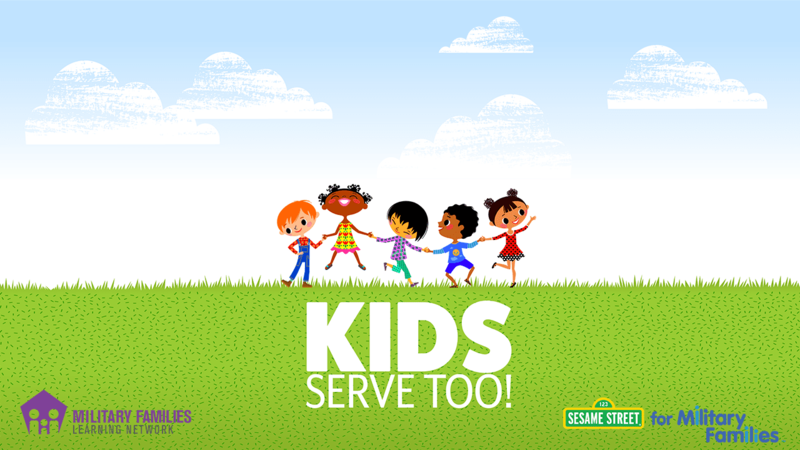 Family Development, Family Transitions, Sesame Street for Military Families: Kids Serve Too!